In 1546 Lawrence Crawford of Kilbirnie founded a chaplainry at Drumry and endowed it with the “five pound lands of Jordanhill”. Thomas Crawford, the sixth son of Lawrence, was a celebrated soldier renowned for capturing Dumbarton Castle in 1571. Thomas subsequently acquired Jordanhill from Bartholemew Montgomerie, the chaplain of Drumry, in 1562. It is possible that he built the original Jordanhill House. In the early 1700’s, Lawrence’s descendant, another Lawrence Crawford, repaired the old house and set out the Jordanhill estate with orchards and gardens. In 1750 the Crawfords sold Jordanhill to a notable Glasgow merchant, Alexander Houston (one of the “Tobacco Lords”). However at the end of the century the firm of Alexander Houston & Co. got into serious financial trouble as a result of their business in slaves at a time when slavery was falling into disrepute in British eyes, and forgetting that slaves unlike other commodities had to be fed and maintained till they were sold. Jordanhill had to be sold in 1800 and it was bought by another Glasgow merchant, Archibald Smith, of the firm of Smith & Leitch. It is very difficult nowadays to realise what Glasgow was like in 1780. The American War of Independence was not yet over, and that war had destroyed the great tobacco trade on which the expansion of the city had been based. The old town had clustered round two centres - the cathedral, and the cross, and had begun to creep only slowly west. The population which had been 17,000 in 1740 was 43,000 in 1780, and doubled in the next twenty years, but even then Glasgow had developed little beyond Jamaica Street though the Blythswood estate was being laid out on paper. The Clyde was still a shallow stream, though the process of deepening and straightening had begun. It flowed through the pleasant wooded hills of Renfrewshire to Dumbarton and the Firth, and Jordanhill was built on one of those hills, looking over the lovely countryside to the spire of Renfrew Church two miles away. Archibald Smith was one of a very extraordinary generation of entrepreneurs that Glasgow produced in the latter part of the eighteenth century. He was the younger son of John Smith the 2nd Laird of Craigend (Mugdock), and with his two older brothers had gone out to Virginia and N. Carolina as traders in tobacco in the 1760s but foreseeing the difficulties arising from the rise of nationalism in what is now the U.S.A. had come home and turned their attention instead to trade with the West Indies. In this they were enormously successful and by 1800 all three were ready to retire from the crowded ‘lands’ of the city to more luxurious living in the country. The eldest brother rebuilt the family home at Craigend as a modest Georgian house, the second son bought Craighead near Blantyre and Archibald bought the estate of Jordanhill for the sum of £14,000 and at once set about enlarging and altering the house to the tune of another £4,000. These sums were very considerable indeed in the early nineteenth century and the resulting house was very much as is seen in photographs of Jordanhill House. The estate was not even at that time wholly agricultural. There were coal mines on the north side, let to the Knightswood Coal Co., who paid a royalty of 3 pence (about 1p) per cartload of coal on approximately 14,000 cartloads per annum, but it appears . that the mines were small and not very productive Household accounts for the estate show that Jordanhill house alone used 198 cartloads of coal at 3/8d each in 1802. One of the first expenses of ownership for Archibald Smith was for gravelling the “footpath from Dumbarton Road to Anniesland Toll by Balshagrie”. This is now Crow Road, and a very different kind of thoroughfare today. In 1821 Archibald Smith died and was succeeded by his eldest son, James. He was a very different man from his father. Like many another son of a busy father, he had early decided that business was not for him. After some years in the yeomanry during the Napleonic Wars, he married Mary Wilson the daughter of a Glasgow bookseller and they lived in the old castle of Rosneath, a property of the Duke of Argyll. He was interested in many things - a man of the new century. He was one of the first yachtsmen on the Clyde and as early as 1806 he had taken a party sailing up the West Coast of Scotland in his cutter. He was a passionate reader and collector of books, had travelled in Italy and brought back fine pictures. He was one of the early geologists who were already thinking in terms of the kind of time-scale of development which underlay the startling theories of Darwin forty years later. Among his other interests James Smith had cultivated the art of architecture. In 1812 his cousin of Craigend had rebuilt his father’s new house there to a plan provided by James, replacing the sensible Georgian Box with a Gothic mini-castle. (The ruins still stand in Mugdock Country Park). James’ sketch books of that time show him to be much taken up with the notion of what could be done with Jordanhill House including a dome and corner towers with pepper pots. However by 1821 he had four children living and another on the way so common sense prevailed and he contented himself with remodelling and modernising the interior. In order to give a point of reference to the view from his library window he designed and erected the pillar which still survives. This pillar stands in the direct line of sight between that window and the spire of Renfrew Parish Church with which he was closely connected. Shortly afterwards, the farm of Gartnavel was added to the estate. James Smith could not, however, live without access to his much-loved boats and in 1827 he bought the Baths Hotel at Helensburgh (later known as Queen’s Hotel and now redeveloped) as a seaside home. Although the Smiths owned it for the next forty years, somehow the name was never changed and the family always referred to it simply as ‘Baths’. Several months of each year were spent there, those of the family who liked sailing loved every moment, and those who did not bemoaned the cold and damp and longed for Jordanhill House. For the next twenty years Jordanhill has little history. The family grew in size - there were seven daughters and one son. The son, Archibald, having passed through the High School by the time he was fourteen, was sent south to school for a couple of years, then to the University when he was sixteen. Having finished his degree in Glasgow with much eclat and many prizes, he went on to Cambridge in 1832, where in 1836 he was the first Scotsman to be Senior Wrangler, and became a Fellow of Trinity. James Smith himself was created an F.R.S. in recognition of his work in geology. In the late thirties, things changed. Two daughters, sent to school in London, contracted a virulent form of tuberculosis. Their parents took them to Madeira in the hope that the climate there would cure them, but one died there, and the other died in London on the way home. A third daughter showed signs of infection. It was clear that drastic measures were needed so Jordanhill was let for five years and the Smiths went to live in Portugal, Spain, Gibraltar and then Malta in the search for health. During this period, the disruption in the Church of Scotland took place. James Smith was an elder of the kirk at Renfrew and a keen and thoughful churchman. His wife was a devoted follower of Dr. Chalmers. She has left a vivid description of her husband in Spain trying to explain in very inadequate Spanish to a Spanish priest who knew even less English the beauties, peculiarities and difficulties of the Presbyterian system of church government. Had he been in Scotland his decision might have been different, but looking at it from far away, free from emotional pressures, he was quite sure that schism was a poor substitute for argument and persuasion, and he remained with the established church though his wife would have preferred to go with her friends. During his later years he published two books of note. One was’The Voyage and Shipwreck of St. Paul’ in which he brought together his knowledge of sailing, of boats in classical times and of the actual geography to elucidate the New Testament story. His other book was ‘Newer Pliocene and Post-Tertiary Geology’ published in 1862 when he was eighty He died aged 85 in 1866. Meantime James’ son Archibald had chosen to become a chancery barrister in London, and had married Susan Emma Parker, daughter of Sir James Parker, Vice-Chancellor, who was also a Glasgow man. He pursued two careers: as a lawyer during the day, and in the evenings and during the vacations, working on the problems of the deviation of the compass, a matter of pressing importance with the invention of the iron ship. This work came to fruition in 1862 and brought him much fame and the Gold Medal of the Royal Society. His fatherJames had died in 1866 leaving the estate somewhat embarrassed. Archibald who inherited the estate died in London six years later on Boxing Day 1872. It was said that his habit of working both by day and by night had worn him out. He left his young widow to bring up their family of whom the eldest, James Parker Smith, was 18 and the youngest only 4. 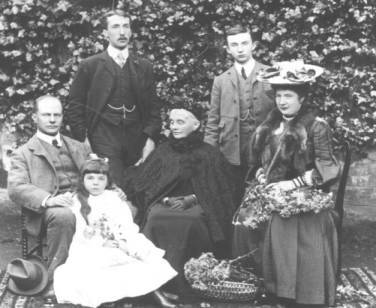 Susan Emma, his widow, decided that it was better sense to remain in her more modest house in Putney within easy reach of her sons’ schools, and in fact she never herself lived at Jordanhill. title deed for properties north of the railway line. She died in 1913. Back left; Archibald Hamilton Parker Smth, the 5th of Jordanhill. He had just celebrated his 21st birthday. Centre left: Rt Hon James Parker Smith, 4th of Jordanhill, MP for Partick. James Parker Smith had been a scholar of Winchester and became a Fellow of Trinity and a barrister. He married a cousin, Mary Louisa, a daughter of William Hamilton of Minard and devoted himself to politics. He became M.P. for Partick and Joseph Chamberlain’s Parliamentary Private Secretary. Glasgow had now begun to spread fast. The Gartnavel part of Jordanhill Estate had already been sold to provide land for the Royal Lunatic Asylum. Bricks and mortar began to swallow up the Jordanhill estate at an ever-increasing rate until finally in 1911 an approach was made to the owner for the mansion house of Jordanhill and the land immediately round it for the establishment of a Training College for teachers. In 1913 the sale was finalised and the direct association of the Smiths with Jordanhill came to an end. James Parker Smith’s son who is referred to in Burke’s Landed Gentry as “5th of Jordanhill” served with the Gordon Highlanders in World War One. He retired in 1920 and died, unmarried, at his home in Australia. In 1989 I wrote to the 6th Smith of Jordanhill, Mr C H G Smith, who lived in Australia and he replied with a most helpful and interesting letter. My main topic had been to find out what happenend to the gold compass presented by the Tsar. Mr Smith explained that when his uncle, Archibald Parker Smith, died in 1971 he became the 6th Smith of Jordanhill, to use his own words “for all that is worth nowadays”. Because there were no further male descendants of the Rt Hon James Parker Smith (the 4th Smith) the succession ran down via the Rev. Walter E Smith, the second son of Archibald Smith (the 2nd Smith) through his eldest son Edward Archibald Smith, then to Edward’s eldest son, Mr C H G Smith (the 6th Smith). It is interesting to note that the 2001 edition of “Burke’s Landed Gentry” states “Archibald Colin Hamilton Smith died unmarried on 5 June 1971 when he was succeeded in the family representation by his first cousin once removed”. This “bible” of landed gentry appears to regard the 5th Smith as being the last of the landed gentry and does not even name his successor. Certainly since the Smith family no longer has any land they can hardly be regarded as landed gentry. Neither Mr Smith nor any of the family in Australia bought the compass so its present whereabouts is unknown. It is particularly interesting to note the above formal valuation which indicated that whereas the story went that the compass was “surrounded in diamonds”, these diamonds were in fact imitation (the technical term is “paste”). Even so, the estimated value of £50 seems a bit low for an item made of gold, but these are the facts as presented to me. The Smith family papers dealing with the Jordanhill Estate and including huge quantities of personal letters, documents and memorabilia are deposited in the Glasgow City Archives in the Mitchell Library. Many of the earlier Smiths (including Jane who founded All Saints Church) are buried in the graveyard surrounding Renfrew Parish Church which was the local parish church for Jordanhill in the 1800’s. James Smith was an elder there.